Valentine’s Day is quickly approaching. I know some people have trouble thinking of gift ideas, so I wanted to share some of my favorite affordable gifts for her. Also, be sure to check shipping options to make sure your gift will arrive on time. I’m on a never-ending mission to organize my jewelry. I saw this bracelet bar at my local Target and it immediately went on my to be purchased list for that purpose. It’s a pretty way to keep your arm party pieces on display. If you’re shopping for an accessories hoarder, then this would be the perfect gift. These earrings are from one of my favorite jewelry designers, Kendra Scott. I love a silver and gold mix in jewelry, and these little drusy studs do it adorable! Also, Amazon states that this item has FREE one-day shipping right now. For the makeup-obsessed, one can never have too many makeup bags, especially when they’re as cute as this. The lip motif is a great theme for Valentine’s Day. This would be especially cool with some NYX lip products stuck down in it. This is the 1st of 4 Kate Spade items on this list (can you tell Kate Spade is a fav of mine???). What I like about these earrings is that they are very festive but can be worn all year round. I personally love the red and white color combo, but these also come in an all-white option. Y’all, I can see this hanging by my front door! It’s 20″L x 17″W, and the knobs will easily hold a lightweight jacket, purse, and/or keys. The sentiment “Family makes a house a home” is so true, and I love the weathered gray frame. Want bonus points? Add pictures before giving the gift for a very sentimental touch. Warning: this item is part of the Kate Spade Surprise Sale, which ends Thursday Feb. 11 at 11:59 PM PT. Dear Chauncey, if you’re reading this, take note. This may be my favorite item on the list! Kate Spade bows always get my stamp of approval, and this color scheme is perfect for summer and spring. 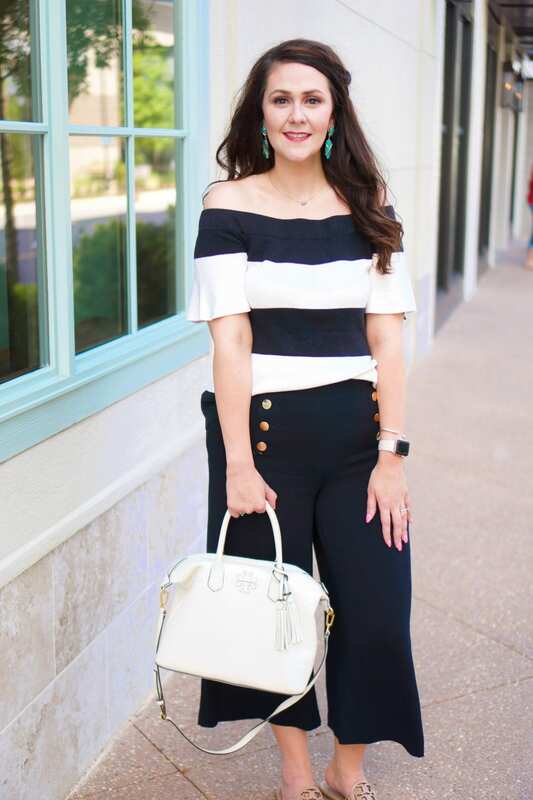 Black and white with a pop of pink? Yes, please! I actually got this tiny cuff in my latest Rocksbox, and I fell in love. This is such a dainty bangle, and it will go with almost anything. The touch of sparkle is just enough. It’s great for people who love to wear an arm party and great for those who don’t. Everyone needs a good crossbody bag in their collection! I love the springy colors in this bag, and the chain detail is darling. As someone with a huge smartphone, I love a bag that can fit more than just my phone in it, and this one is a great size to throw several items in. I love this bag! I love the buckle detail on this bag. It’s versatile in that it can be worn either over-the-shoulder or over your wrist. My favorite thing about it, thought, is the sectioning on the inside of the bag that will allow you to keep organized. 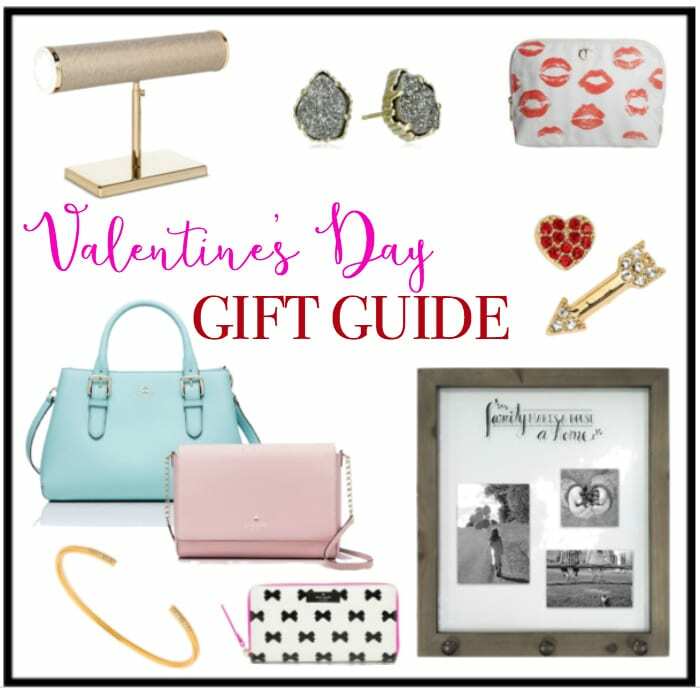 Also, if you are buying for someone from Kentucky, this Shop Local Gift Guide I pulled together at Christmas will work just as well for Valentine’s Day!!! Good luck shopping! And don’t forget that Thursday (02/11) is our next H54F Google Hangout at 9:30 PM EST! Details will be up on Thursday!